Leaving Zanzibar, I caught a flight to Dar Es Salaam on the mainland and proceeded to waited for my flight to Johannesburg which ended up being delayed until midnight. This was a slight problem because I was couchsurfing in Johannesburg. The guy I had been talking to said he would pick me up from the airport but with my flight arriving at 2:30am now I was a little unsure. Arriving in Johannesburg, I walked out of the airport and Stephano was there waiting for me. Couchsurfing is a website for backpackers and it consists of a large community of people that offer up their couches and spare rooms to travelers. This is how Stephano and I met. He offered me his spare room while I was in Johannesburg for two days. Stephano was really nice and we hit it off talking right away. I was very thankful that he picked me up from the airport and offered me a place to stay. Since he had to be up early for work, he gave me a set of keys and directions to catching the bus to get into town in the morning. Waking up in the morning I hopped on a bus and headed to central Johannesburg. I wanted to visit and see Constitution Hill. It is a major sight in Johannesburg and used to be a prison called the Old Fort. It housed many political prisoners including Nelson Mandela and Mahatma Ghandhi. They even had a pair of Gandhi’s sandals on display! Old Fort continued to serve as a prison until 1987 and then in the 1990’s reconstruction started. The Old Fort was turned into Constitution Hill. 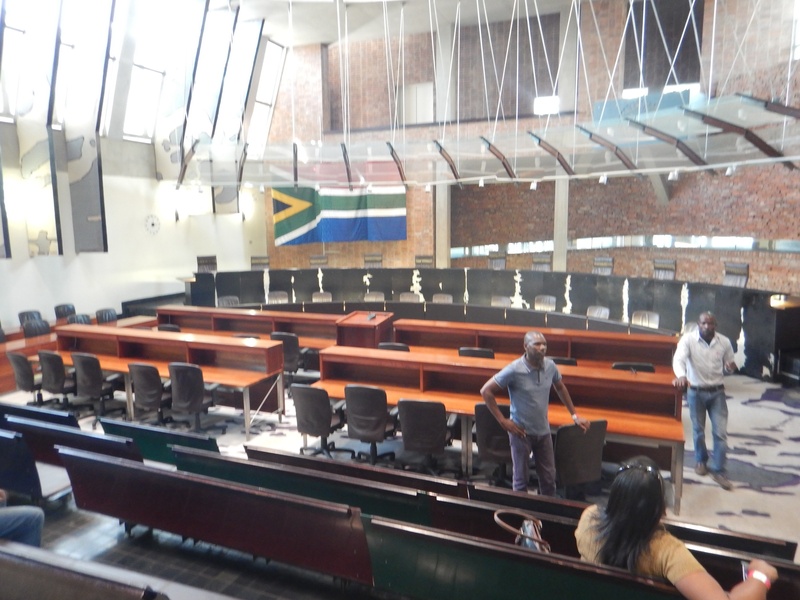 It is the highest court in South Africa for Constitutional matters. Bricks from the old awaiting trial building were used to build the actual Constitutional Court building. It was very interesting to find out this fact, using old materials that were meant for harm to now help better the country. After visiting Constitution Hill, I ended up walking around some more. It was different walking around because there was lots of trash everywhere. People did not throw their trash in bins like I was used to but instead just threw it on the ground. Also, all up and down the streets, there were street venders out selling food and goods. I met back up with Stephano later that night after he got off work. We went back to his place, ate some food and spent a few hours talking. He was a really cool guy that had done quite a bit of traveling so we ended up swapping some stories. I also learned more about South Africa and Johannesburg. It was a good day spent in Johannesburg and I was able to learn quite a bit. This whole trip had been a blast and seeing all the different places was really cool. For now, it was time to head back to Durban.